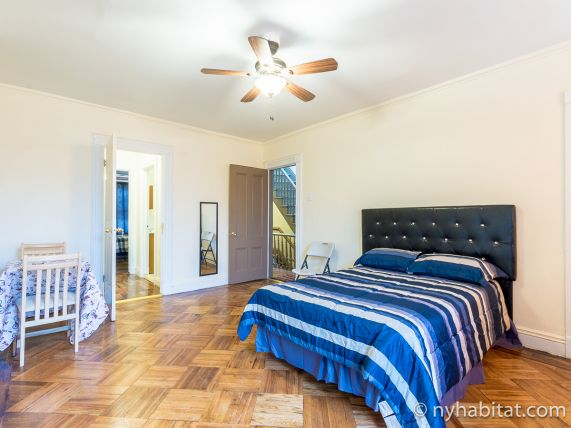 Experience Brooklyn like a local when you rent a room at this 2 bedroom apartment share located in a classic 19th century townhouse in the Bedford Stuyvesant (known by locals as “Bed-Stuy”) section of Brooklyn in New York City. 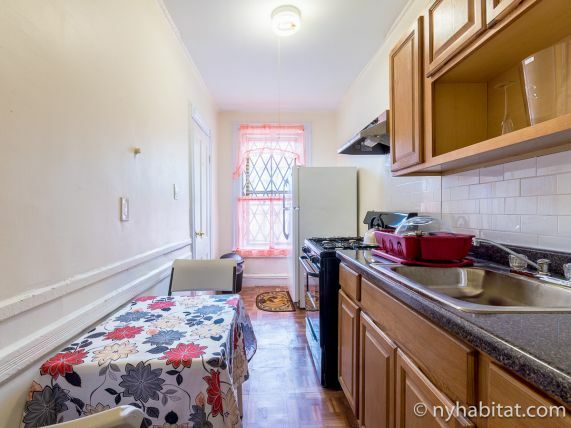 The apartment is located on the 3rd floor (2nd floor European) of a 3 story townhouse property with northern and southern exposures located near Clifton Place and Nostrand Avenue. 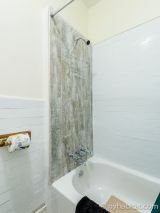 This furnished 2 bedroom apartment share offers two spacious bedrooms for rent with shared kitchen and bathroom. A shared apartment offers a chance to live with another roommate and make a new friend, or if both bedrooms are available for your dates, you and a friend can each rent a bedroom and share the apartment. 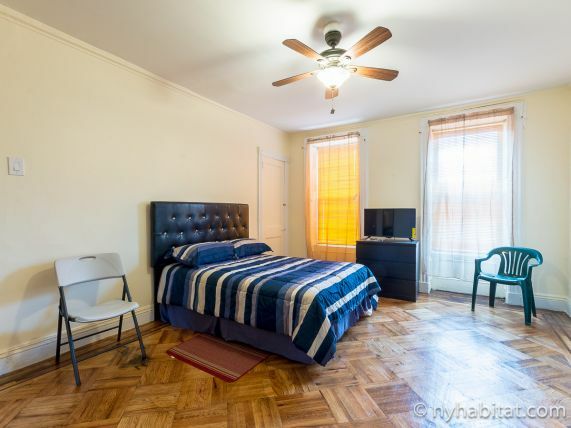 Bedroom 1 has parquet wood floors, white walls and plenty of windows, along with a ceiling fan to circulate the breeze. 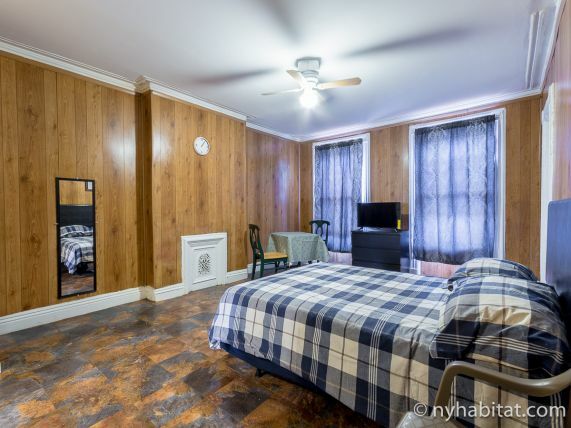 It is furnished with a double size bed and flat screen TV for entertainment. A small table for two in the room provides space to enjoy meals in privacy if you choose or you can use it as a work/study spot. A dresser and closets provide storage space for your belongings. 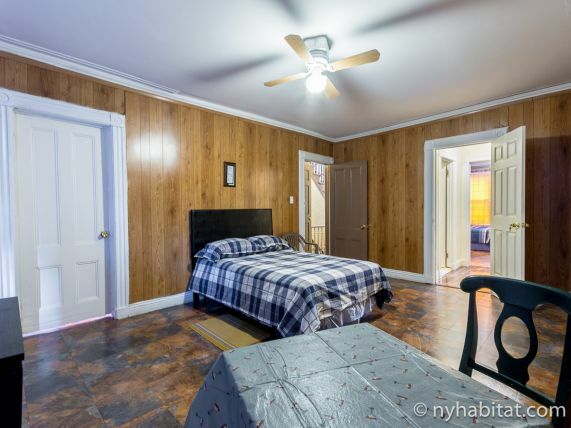 Bedroom 2 has cozy wood paneled walls and large windows, along with a ceiling fan. It is furnished with a double bed and flat screen TV for entertainment. For storage, a dresser and closets are available. A small table and chairs is also located in the room for meals or studying. 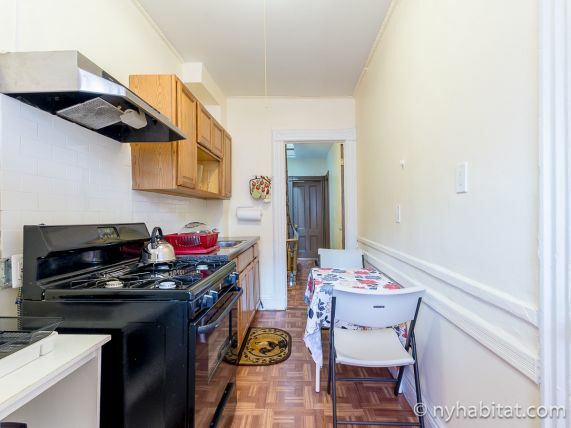 The shared kitchen has a dining table and is equipped with stove/oven, refrigerator, microwave and toaster so you can prepare meals at home, allowing you to save money if you’re on a budget. 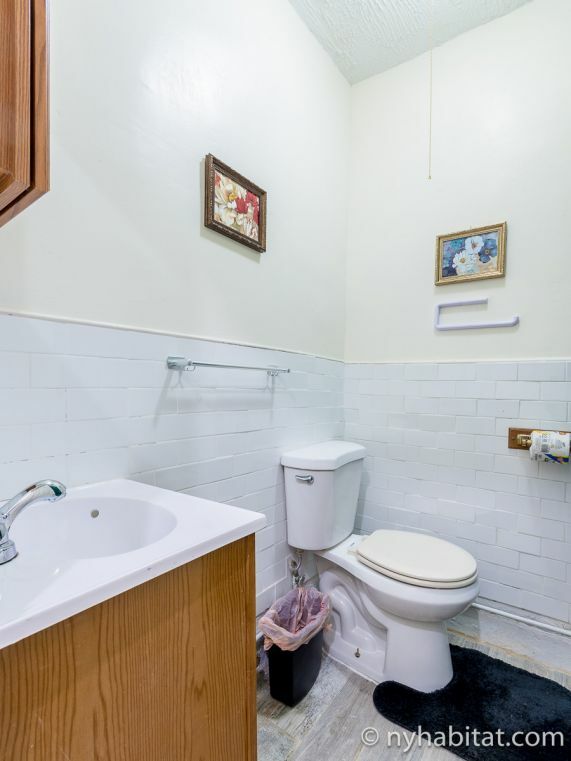 The shared bathroom has both tub and shower options and is located between the two bedrooms. Bedford Stuyvesant is a neighborhood located in the north central section of Brooklyn bordered by Williamsburg, Clinton Hill, Bushwick and Crown Heights. You can find many historical brownstones here. Spend an afternoon strolling through the Stuyvesant Heights Historic District where you can admire the history and architecture of classic NYC brownstone and townhouse buildings. Sample the variety of neighborhood restaurants including Pilar (.2mi/.32km away) for Cuban cuisine, breakfast and brunch or Eva Jean’s (.1mi/.16km away) an inviting spot with wood ceilings and exposed brick walls serving up late night drinks, a menu of seasonal new American farm to table cuisine and live performances by local artists.